Shilo Village is located on the southern part of the Island of Karamja and the only way into the village is if you have completed the Shilo Village Quest. In Shilo Village there are various things to do and is most famous for it's Gem Rocks where you mine to obtain all sorts of gems. Runecrafters who have completed the quest use it's bank for easy Nature Rune runs. 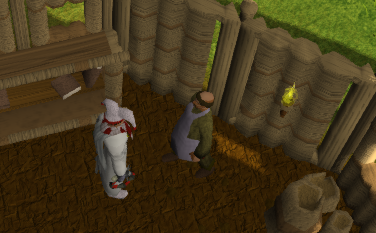 To get onto Karamja, you can either talk to Captain Barnaby on the Southern part of Ardougne and pay him 30gp to get across, you can also talk to the Seamen in Port Sarim and they will take you onto the island for a charge of 30gp, but be prepared for a lengthy walk, or if you have completed the Grand Tree Quest, you can use the Gnome Air Gliders to get onto the island. 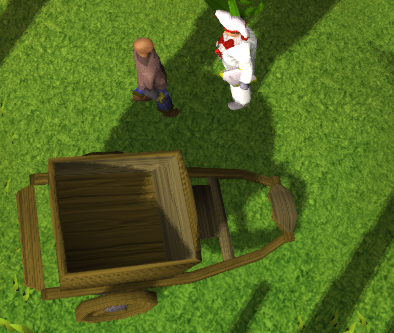 The most popular way is to talk to Captain Barnaby in Ardougne and use the travel carts in Brimhaven that are located a little ways east off the docks. 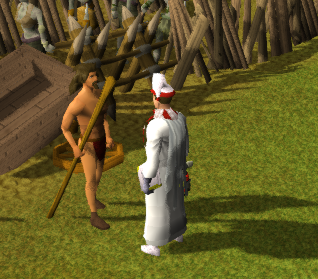 Talk to Hajedy and pay him up to 200gp and he will take you safely into the village. 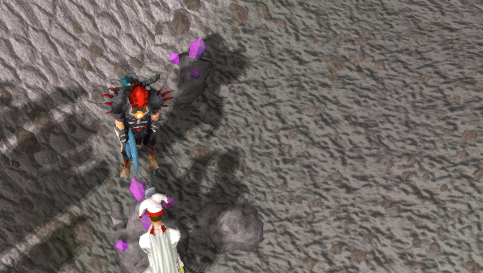 If you have completed all Karamja Tasks, you can 'use' your Karamja Gloves 3 to teleport to a gem mine beneath the village. If you choose to walk to the village, you can either talk to Mosol Rei who will guide you safely into the village or search the cart, and open the two wooden gates to get in, but beware of the Undead Ones. 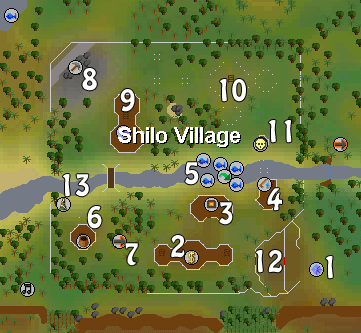 At the entrance of the village is where you can begin the Shilo Village quest. Speak with Mosol Rei and he will help you begin the quest. Once you have finished the quest, if you speak to him again, he will guide you safely into the village. There is a bank located inside the village with two bankers who will help you with any transactions you will need to make. 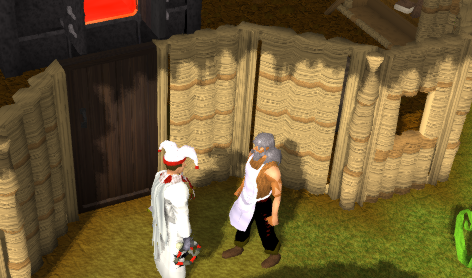 Just outside of the bank is the furnace that is shut down, talk to Yohnus and for a fee of 20gp you are allowed to use it but will need to pay another 20gp if you need to go back in. 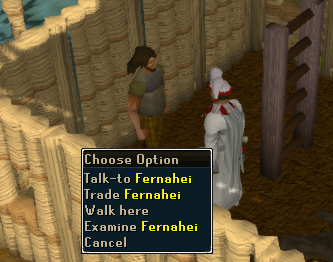 The fishing shop is located just east of the furnace and Fernahei will show you his many items for your fishing needs. Seravel is located upstairs in the Fishing Shop. 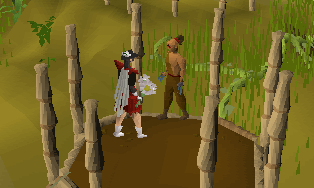 He sells tickets to ride the 'Lady of the Waves' which is a ship that can take you to either Port Sarim or Khazard Port. The ship is located west of the Shilo Village and south of Cairn Island. The tickets cost 25gp per trip. To the west of the fishing shop there are many fishing areas where you can lure or use fishing bait to catch all the various fish. On the western side of the village is the general store owned by Obli where there are various items you can purchase if you need and where you can sell any items you don't need. West of the bank there is another transport cart that will take you back to the cart that originally brought you into the village. Speak to Vigroy who will also charge up to 200gp for the ride out of the village. Located in the north western corner of the village across the bridge, are the gem rocks where you can mine for Opal, Jade, Red topaz, Sapphire, Emerald, Ruby or Diamond and use them later for your crafting pleasures. Dragonstone however, cannot be mined here. Additionally, there is a gem mine located below the village which you can only access by operating your Karamja Gloves 3. East of the gem rocks is a house where you can begin the One Small Favor quest. Speak with Yanni Salika to begin and obtain more details. He will also look at old items that you may have, appraise them and buy them off you for a fair price. 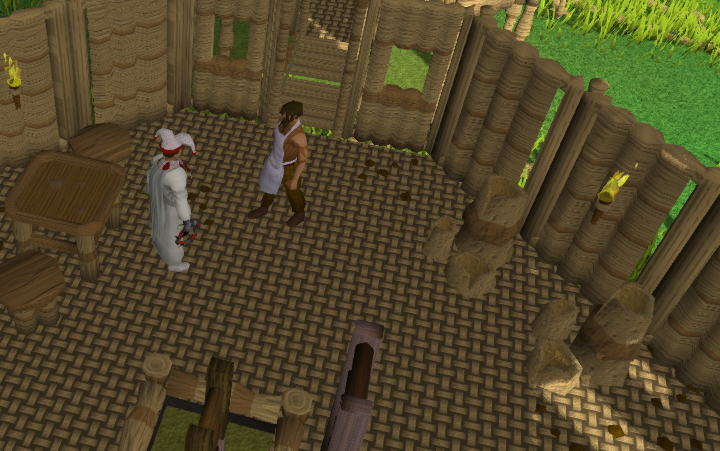 You can sell him your items after you have completed the Shilo Village quest. Further east of the quest start point is an Inn where you can pay 175gp for 5 tickets to spend the night and wake up refreshed or you can spend your time in the pub with some friends. Just climb up the latter and speak to Kaleb Paramaya for what you'll need. 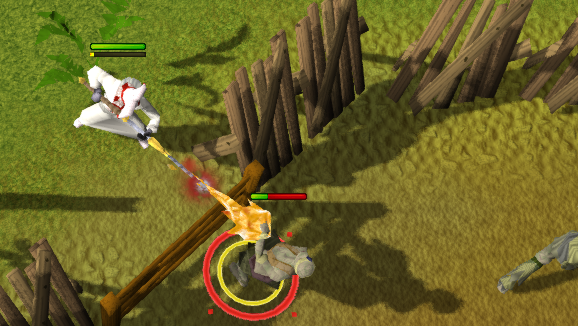 Kaleb Paramaya is also an adviser in the Karamja tasks. 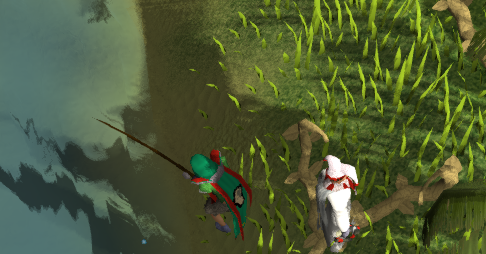 To speak to Duradel, the slayer master located inside the village, you must go to the fishing shop and climb up the ladder, go north across the walkway and speak to him. You can also buy various slayer items that will help you with your assignment. If you have completed While Guthix Sleeps, Duraldel is replaced by Lapalok. Mages like to work on their magic inside of the village on the Undead Ones which vary in levels.